Each year, the Good Hope Lions Club provides monetary donations to several local community organizations and activities. These donations include the following: Fayette County and Greenfield food pantry, Ohio’s Hospice of Fayette County, Meals on Wheels, Fayette County Diabetes Association and Society for the Disability, Life Pregnancy Center Care Packages for our overseas troops, United Way, Fayette County Junior Fair, Community Heath Fair, The Well at Sunnyside, the Fayette County YMCA, Bread of Life, Fire in the Sky, Angels in Waiting, Cystic Fibrosis Foundation, the Good Hope United Methodist Church and St. Vincent de paul Church, and Miami Trace, Washington Court House and Greenfield-McClain scholarships for graduating seniors. Pictured are Washington Court House guidance counselor Lisa Hoppes, scholarship chair for Miami Trace Mallory Bihl, and Lion Gary Spears. Each school received six $500 scholarships this year and the Good Hope Lions Club thanked the community for their generous support of their annual candy store and pancake meals. 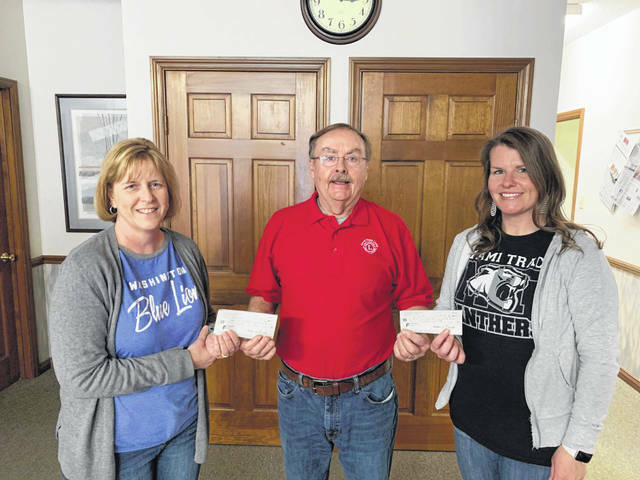 https://www.recordherald.com/wp-content/uploads/sites/27/2019/04/web1_received_351056265615788.jpegEach year, the Good Hope Lions Club provides monetary donations to several local community organizations and activities. These donations include the following: Fayette County and Greenfield food pantry, Ohio’s Hospice of Fayette County, Meals on Wheels, Fayette County Diabetes Association and Society for the Disability, Life Pregnancy Center Care Packages for our overseas troops, United Way, Fayette County Junior Fair, Community Heath Fair, The Well at Sunnyside, the Fayette County YMCA, Bread of Life, Fire in the Sky, Angels in Waiting, Cystic Fibrosis Foundation, the Good Hope United Methodist Church and St. Vincent de paul Church, and Miami Trace, Washington Court House and Greenfield-McClain scholarships for graduating seniors. Pictured are Washington Court House guidance counselor Lisa Hoppes, scholarship chair for Miami Trace Mallory Bihl, and Lion Gary Spears. Each school received six $500 scholarships this year and the Good Hope Lions Club thanked the community for their generous support of their annual candy store and pancake meals.